Temple Canton, outside the Archcanon's Office. 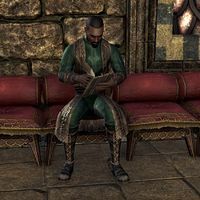 Renazh at-Sadil is a Redguard noble who can be found in the Temple Canton of Vivec City. He's on the upper level just outside the Archcanon's Office. He cannot be talked to. Prior to Update 12, he was found in Renazh's House in Sentinel. This page was last modified on 2 March 2019, at 10:05.